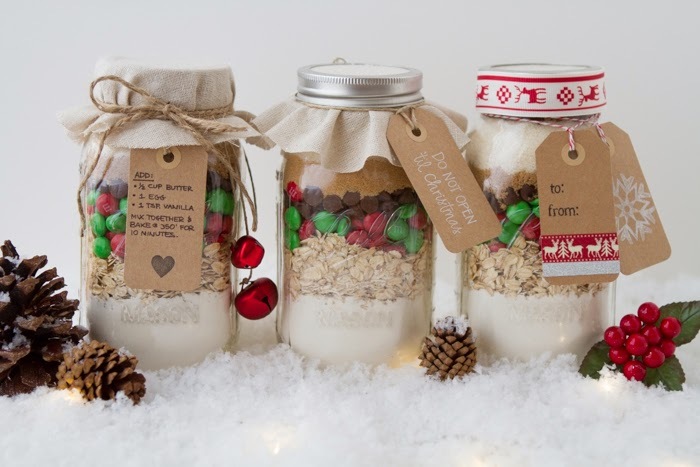 Have you noticed yet that we love Mason jars? Haha. We were just saying the other day that we should probably be sponsored by them because we're so obsessed. 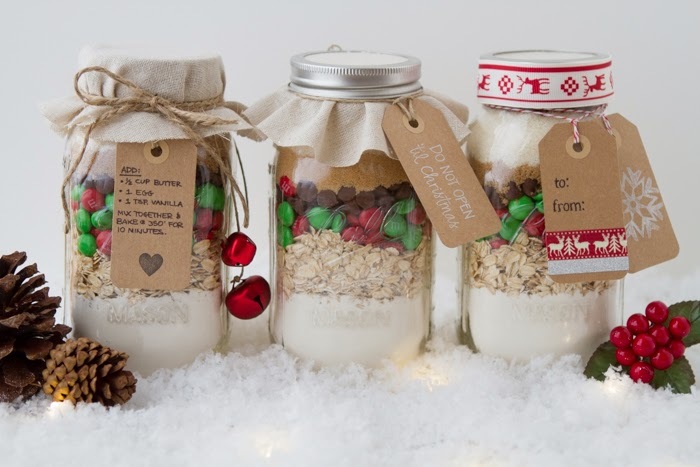 We've used them for our candles, our granola, our caramel corn, our strawberry jam... They just make the most adorable packaging and are so easily customizable for gifts. Plus, the recipient can reuse them when they're done. 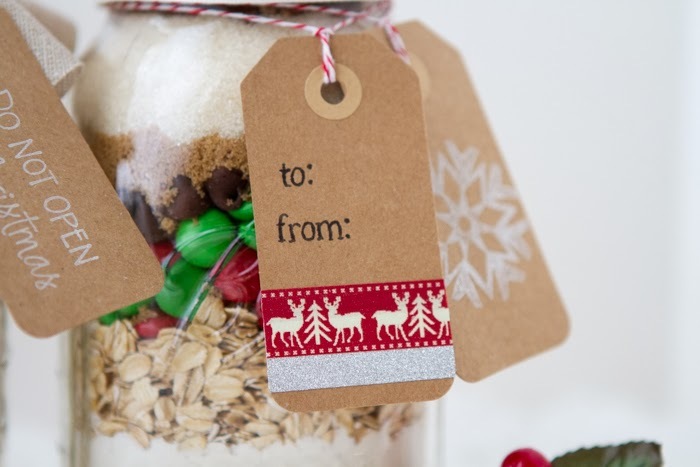 Today we're filling our Mason jars with an awesome Chocolate Chip Oatmeal Cookie Recipe. That's right - these are ready-to-be-baked cookies! We've layered the jars with the dry ingredients and all the receiver has to do is add the wet ingredients, mix it up & pop them in the oven! We love this gift for the holidays because it's perfect for those busy folks that don't feel like they have time to bake, as well as friends who may not feel like they're very talented in the kitchen. These jars make cookie-making super easy. (They're also great to have on hand for when all that delicious holiday baking runs out). 1. In a quart sized Mason jar, layer your ingredients in this order. Pack them down between layers to make sure they all fit. We made a funnel out of paper which made filling the jars much easier. 2. 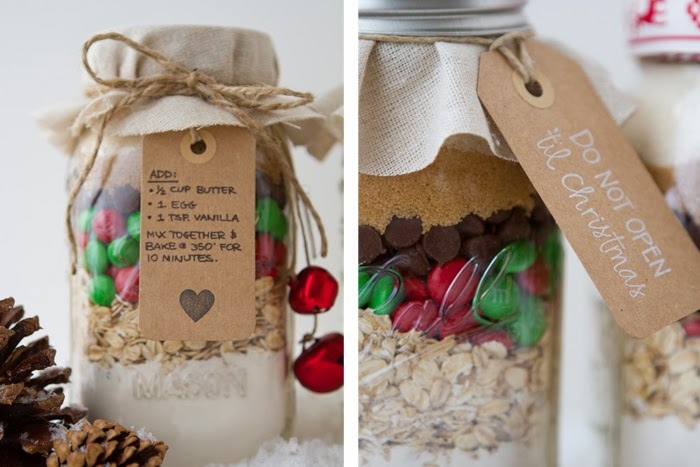 If you have any extra room in the top of the jar at the end (you may not) you can top it off with extra oats. Roll into 1.5 inch balls. * These are some extra tips we found to be good when making the cookies: Let your melted butter cool a little before you add it or else it will melt the chocolate chips. Your hands work best to really mix this dough together so get in there! If you make giant cookies (like we did with our first batch) just cook 'em a few minutes longer. 4. Add some cute fabric & tags and you're done!